Experience "old Hawai'i" in this unique, plantation-style home. 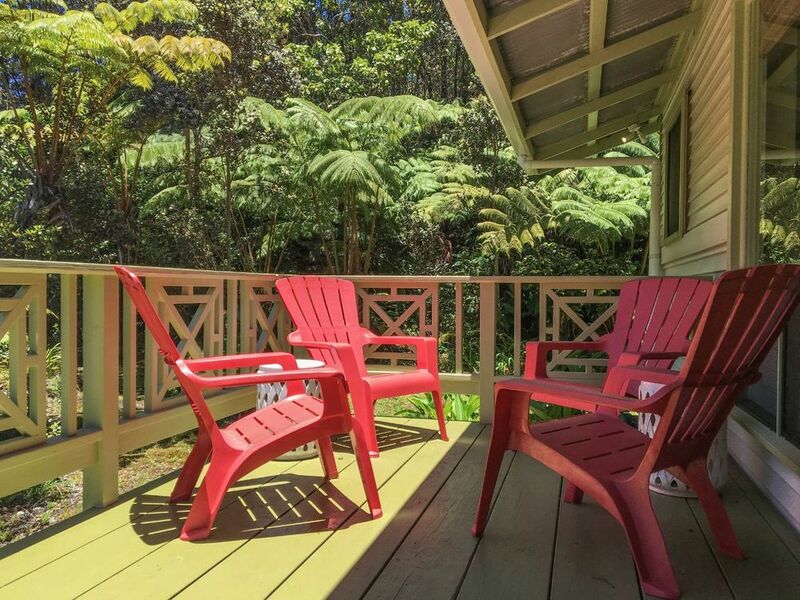 The word kupu simply means "to grow or sprout" and this house honors the kupukupu fern, one of the first plants to bring life back to the land after a devastating lava flow, initiating the coming of the forest. The Hawaiians believe that the kupukupu fern is symbolic of growth and new beginnings and that with each new frond comes new opportunity, new experiences, and a fresh start. Hale KupuKupu is constructed from old growth redwood planks in the single-wall design traditional to the islands during the plantation period of the 1930s and '40s. Louvered jalousie windows allow the trade winds and mountain breezes to keep the house cool during the day and a fire in the wood-burning stove can warm the evening chill that comes with the higher elevation. We provide lots of dry split wood, paper, and fire-starters and ceiling fans help to circulate the warm air. 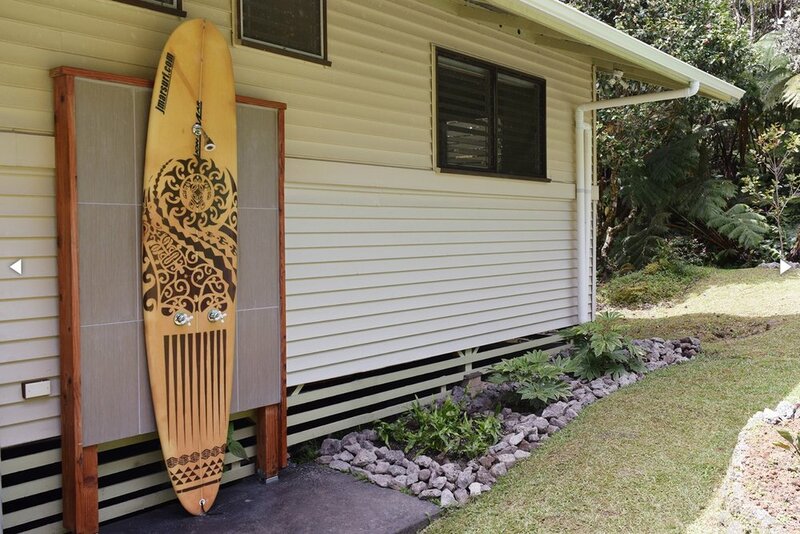 Decorated in a style that honors the Island's blending of Hawaiian and Asian Cultures, the home has two cozy bedrooms with queen-sized beds and a Balinese daybed in the living room, allowing it to sleep up to five people comfortably. For families traveling with small children, there is also a pack and play crib available. The full kitchen is equipped with everything you need to leisurely prepare meals at home and the free high-speed wifi, laptop-friendly work space, cable television and covered parking make this cottage a convenient and comfortable home away from home. Hale KupuKupu offers a quiet and tranquil experience, reminiscent of a lifestyle from an era gone-by. The outside surroundings of the house provide natural beauty and incredible privacy with Adirondack chairs on the front deck and a picnic table in the garden. 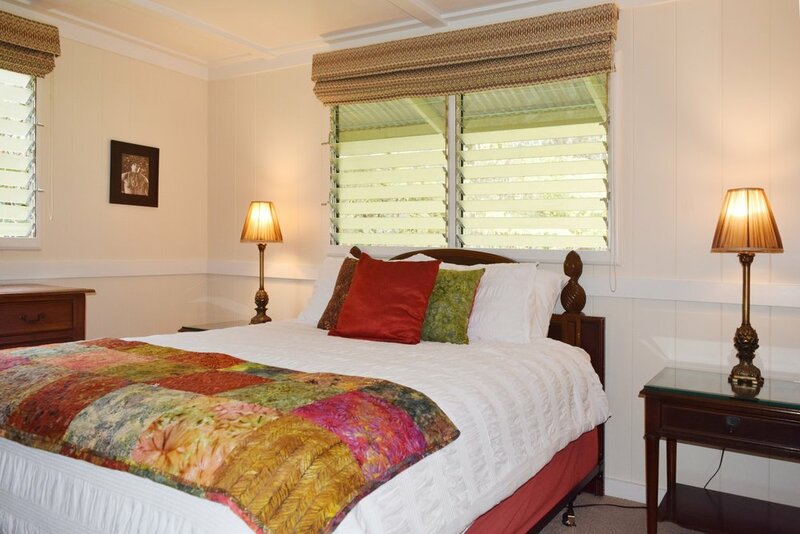 There is even an outdoor shower to the back of the home, allowing you to enjoy a warm, invigorating wash after a long day at the park while gazing out into the native rainforest and1/2 acre of park-like landscape. From the front door, the heart of Volcano Village is just a 10 minute walk away. Amenities in the village include several diverse restaurants, 2 grocery stores, 2 gas stations, a launderette, a post office, a nearby local winery, an 18-hole golf course, gift shops, art galleries and "da best" Sunday morning farmer's market at Cooper Center, located just blocks away. 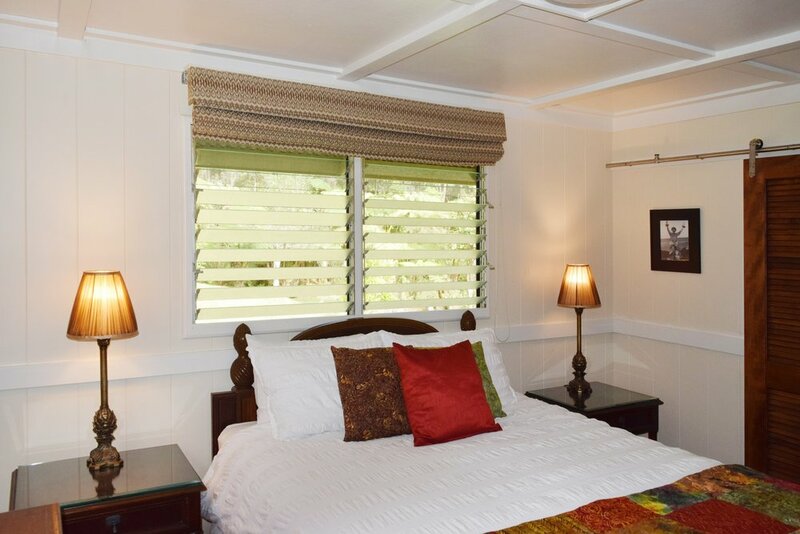 Located just five minutes from the entrance to Hawai'i Volcanoes National Park and just 40 minutes from Ka Lae (South Point), Green Sand Beach and Punalu'u Black Sand Beach, where you may see turtles nesting and swimming. You are also 40 minutes away from historic and beautiful downtown Hilo with restaurants, shops, museums and nearby snorkeling beaches. For your comfort and security, the property is equipped with an electric gate, keyless entry code and a security camera to the front of the house. 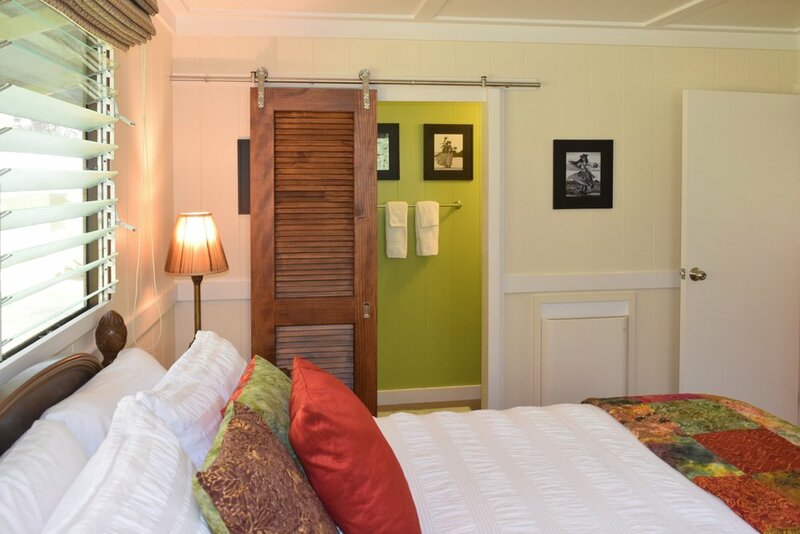 Prices: Low season: $145.00 per night (double occupancy). 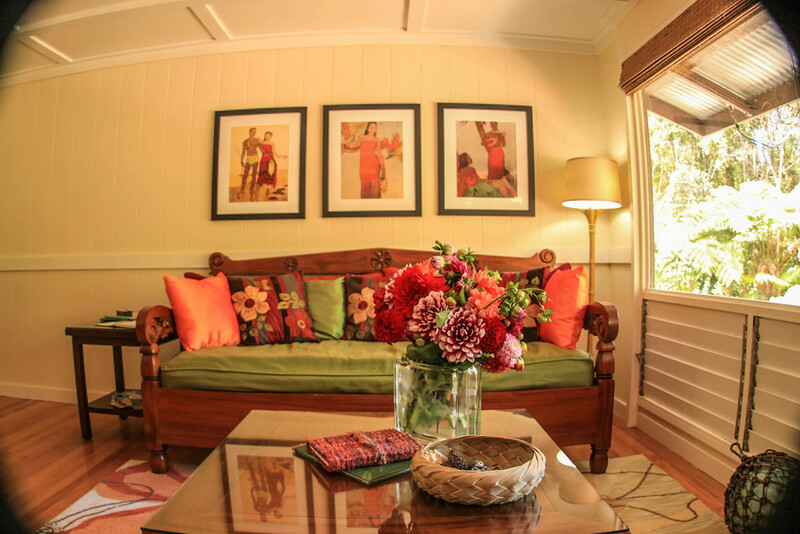 High season: $165 per night (double occupancy). 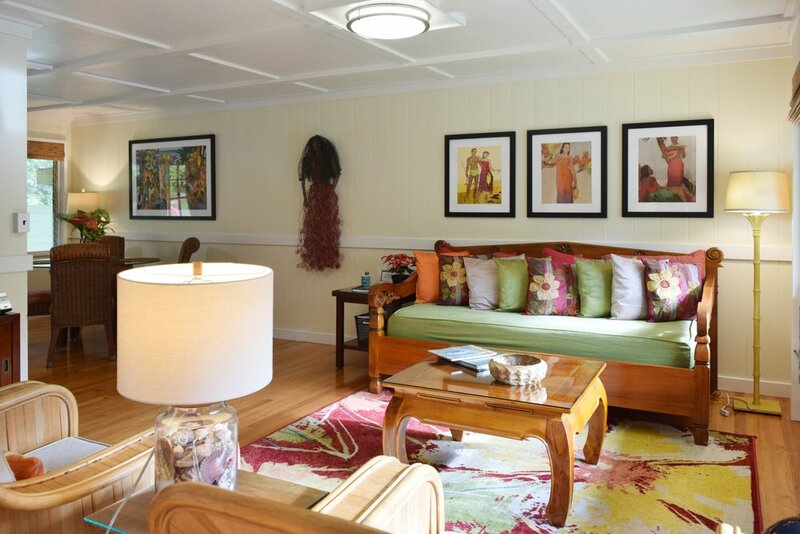 Rooms: 2BD/1.5BA; master bedroom with queen and en suite half bath, second bedroom with queen, Balinese daybed in living room. Pack and play crib. Complimentary: Locally roasted gourmet coffee, variety of teas, liquid cream and sugar, starter supply of toilet paper and paper towels, spa grade body wash, shampoo and conditioner, fresh cut tropical flowers. Amenities: Outdoor shower, wood-burning fireplace, bedroom convection wall heaters, hypo-allergenic pillows and duvets, dual-control electric blankets, linens, towels, spa robes, fully stocked chef’s kitchen that includes a dual-oven gas range with griddle, microwave oven, coffeemaker, toaster, blender, rice cooker, Kitchenaid mixer, refrigerator/freezer with ice maker, cable television, Wi-Fi, Bluetooth enabled sound bar, alarm clock, landline phone, smoker/grill, picnic area, beach towels, umbrellas, board games, Pack ‘n Play baby care station. Smoking: No smoking anywhere on the premises. Laundry: No laundry facilities available. Parking: Free covered parking available. Security: For the security purposes, there are exterior cameras at the front of the property. These do not film inside the home and are positioned so as to not infringe upon the privacy of our guests in any way.